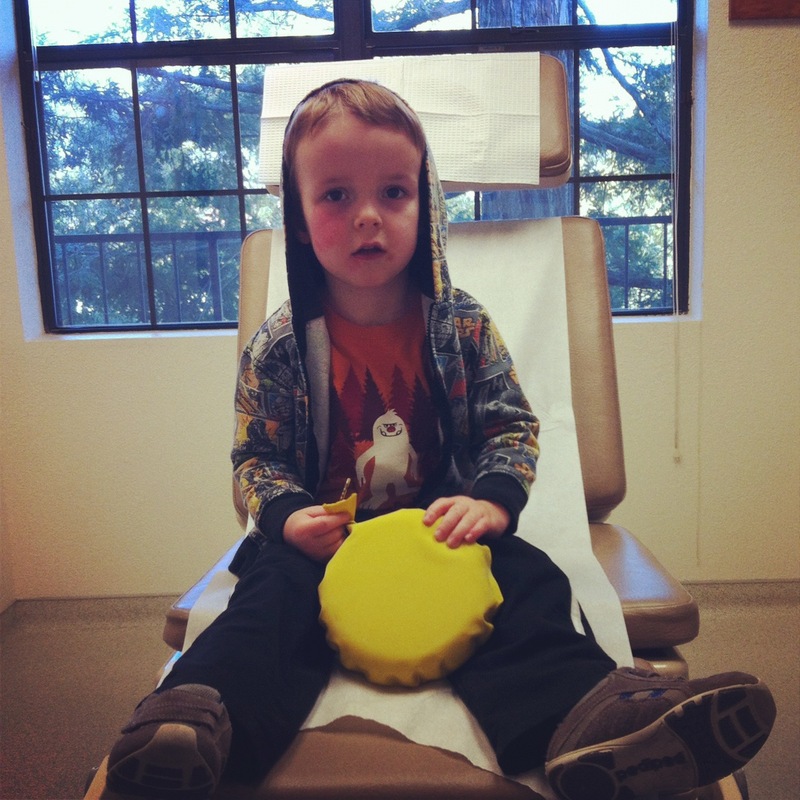 Today I took the 3 year old to the dermatologist. And the baby. The baby didn’t have an appointment but he had to come along, trapped in a stroller with a bad attitude and a strong desire to throw everything ON the GROUND. My 3 year old has been “rashy” for months now. He’s had a little red patch on his face since May that I chalked up to eczema, but at some point it started to grow and over the course of the past few months and about four or five doctor appointments, it has been diagnosed as ringworm, eczema, ringworm, eczema with a bacteria infection, etc. We’ve tried three ointments in the past two weeks. When the Doctor told me authoritatively that it was eczema with an infection, I dutifully applied the antibiotic ointment. And then the red dots came. And they spread. And the Doctor told me to go to the dermatologist which, frankly I SHOULD HAVE DONE A MILLION YEARS AGO. And that’s how I brought a completely red and spotted 3 year old into a dermatologist’s waiting room with a whoopee cushion. It was remarkably loud. The receptionist was an older lady and she soldiered through her explanation on how to fill out “THBTTTT!” the “FTTTHPTTT!” paperwork. I have no idea what she said. I started to question my original premise that fart noise is better than crying sounds. Is it? Is it really? “Why you not want me to use my cushie cushie?” he asked. My brain ran away. I didn’t even answer. How could I? Calling a whoopee cushion a cushie cushie? That’s when I realized I was defeated. How could I even? Say? What? I just hunched over my “THHPTT!” paperwork and tried to remember my “PFFFTT!” social security number. p.s. it was eczema and a virus. fun combination, but he only needs lotion. It can also be referred to as a “Toot Pad” if your child is so inclined. And neuro appt are the WORST!! I feel for you. They deserve a cushie cushie! Oh, that's hilarious! My sons loved those things. And my daughter and I would just roll our eyes and ignore them. I shouldn't have said “loved” as in past tense. Ethan brings his out quite regularly and really gets me with it some days. “Ethan!” Ha. thats amazing. probably embarassing too. but i think its amusing. The whoopie cushions with the foam are the best!!!!!!! My husband won't let me have one 😦 Why he not let me play with cushie cushie? Why is it creepy when I ask it? You are one brave mama. That brought a loud guffaw to my day. Thank you! Hopefully the PFTT paperwork came through okay?